Training to understand and practice the roles and functions of a deployed medical component within an urban search and rescue task force during a disaster response. This training provides medical personnel from a DMAT, SMAT, EMAC, US&R TF or other Medical Team with the knowledge, skills, and confidence to succeed before, during, and after a deployment. Medical team members learn about the unique challenges involving a natural incident, act of terrorism or man made disaster. It is a must for any deploying medical group. 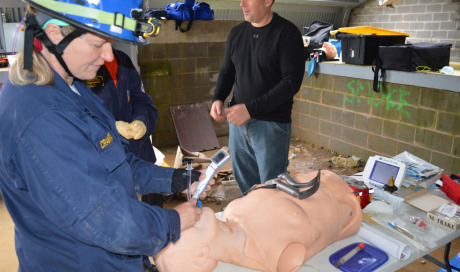 Whether participating in a training course or integrating into an exercise, these skills provide participants the ability to confidently perform medical assessment and care at a structural collapse disaster scene due to natural disasters or terrorist incidents. Our key personnel and subject matter expert instructor cadre has the experience and past performance to deliver the best medical rescue training available.